Monico Barumbado: That only means na kahit magàling ka ng mag english ay mababago mo ang ugali mo. Ang galing mo te. Sana kunin ka ng call center para naman masubok ang galing mo. Should I say subukin mo kaya. Lovely Pamplona: Wow naman ate Jenny tatak USA daw pero why is her English difficult to understand? ABUSED OF MY TIME daw? What do you want to mean Arte, este Ate? . Do you just want to be noticed. You have embarrassed yourself with your comments. Come home to the Philippines, the call centre agents can teach you how to use the English language properly. Baka you were not able to express or state the reason why you contacted, then you blame them for not comprehending. You may also need sessions on correct grammar, spelling and how to organise your thoughts in English. I can't understand why you were not happy with the service you received. You have to express yourself correctly to be understood. I am happy when served by a Filo operator who is professional, have patience and respect for the callers.. They do not have to deal with callers from hell, but mind you they can overcome customer aggression. I am proud if my friends here overseas praise service reps they have spoken to who are based in the Philippines. Pontia Pilata: Mild pa yan, yung pamangkin kong nurse daw kuno sa US, descriminated me as Neanderthal clan!! !Maraming mayayabang na nakaapak sa ibang lupa, na matataas ang ere! 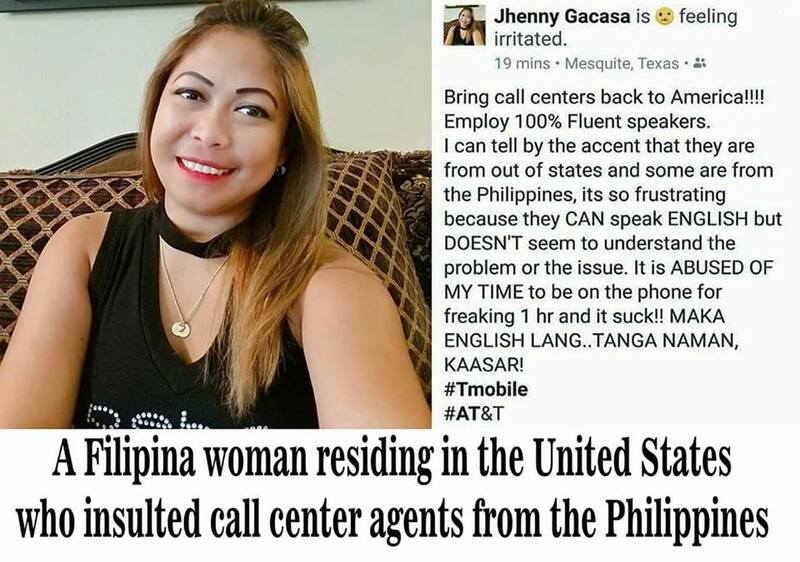 Kahit may pag- kukulang ang call center agent, kapareho niyang Filipina yan,,,,, tinuwid na lng sana niya ,,, sa approach na katanggap tanggap at di nakaka offend...... Ang tanong,,,, How much and How big are your difference with Filipinos working locally and in US..financially and eco- social standard ? Wala di ba? Kayo, alipin ng ibang bansa,at ginagawa nyo yan para sa pansariling kapakinabangan.... Kami, pilit naming ibinabangon ang ekonomiya ng bansa, kahit sa mumunting buwis na kinakaltas sa bunga ng aming pawis at kapaguran!!!!! Evangeline Fragata: You, too, are a second English language speaker meaning English is not your native tongue! As such, you must be aware that language is just one of the many elements of biodiversity! You must be proud that our Filipino call center agents can communicate well in a language not their own instead of despising them. If you did not understand what the agent was telling you, admit it or not, you just happened to be below her level of intelligence! Damn your slang! Damn your American accent! The fact that you needed the services of a BPO representative means you are not as competent as you think of yourself! Braggart!